The early years of this short history of IMHAANZ came out of a conversation between Denise Guy and Jacquie Sokolov Pearson in September 2016. The first newsletter of the Australian Affiliate for Infant Mental Health (AAIMHI) includes a ‘Report from New Zealand’. Keryl Egan, President of AAIMHI, had previously visited New Zealand and in Dunedin met with Dawn Manley (then Director of the Child and Adolescent Psychotherapy training), Angela Stupples, Kathy McKergow and Rosie Adams – a group interested in the Australian experience and keen to see developments in infant mental health in New Zealand. Kimberley Powell, a lecturer in Early Years Education, and Janet Gregory, a lecturer in Health and Human Development, both at Massey University, begin an initiative ‘calling all New Zealand professionals, academics and children’s advocates together to register their interest in establishing a new interdisciplinary infant mental health group’. A number of people sign up and, early in 2005, thoughts turn towards the idea of WAIMH Affiliation. 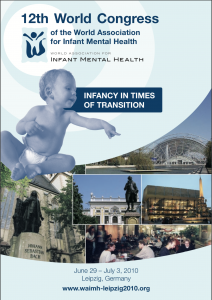 WAIMH is the World Association for Infant Mental Health (www.waimh.org) with affiliates around the globe. Kimberley and Janet meet with Denise Guy, a child and adolescent psychiatrist, at the Brown Sugar café in Otaki to consider what is required for an application to WAIMH to become an official affiliate. Kimberley is a past committee member of AAIMHI and Denise, a Foundation member of the Australian Affiliate. Denise brings her box of AAIMHI documents and – with good coffee and sunshine – preliminary plans are made. The first meeting is held in Wellington to formally organise the application to WAIMH. Kimberley, Janet, and Denise are joined by Joan Sykora, Norah Fryer and John Brickell. Help (much appreciated) comes from partners and the group is especially appreciative of Ian White’s contribution to the task of developing the first Deed and By-Laws. Discussion is held about the name and Infant Mental Health Association Aotearoa New Zealand – or IMHAANZ for short – is settled on. The application for Affiliate status to WAIMH is submitted. At the Paris meeting of WAIMH, IMHAANZ is accepted as an official affiliate following a unanimous vote from the WAIMH Board of Directors. The decision is conveyed in a relaxed way by Hiram Fitzgerald in a chance meeting in the lobby of the conference venue and more formal written congratulations follow. Dr Kimberley Powell is the first President of IMHAANZ. The first newsletter announces the intention to launch the IMHAANZ affiliate at a one day conference in April the following year. 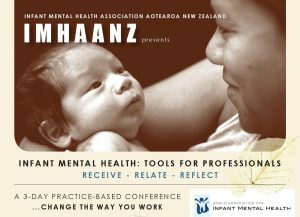 The first conference and official launch of IMHAANZ takes place in Wellington; this event is called ‘Strengthening Relationships: Beginnings in Infant Mental Health in Aotearoa, New Zealand‘. Here Elizabeth Muir and Patricia Champion accept the invitation to be Patrons of IMHAANZ. The Honourable Steve Maharey, Minister of Education, gives the launch address. The Elisabeth Muir oration is established and Elisabeth herself gives the first oration. Other speakers are Beulah Warren, Sarah Te One and Dr Trecia Wouldes and Denise Guy. Beulah provides a workshop focused on the Getting To Know You film developed by the NSW Institute of Psychiatry. Interest regionally becomes formalised with regional networks established in the Manawatu, Christchurch with Norah Fryer, Wellington with Maree Foley, Waikato with Lauren Porter and Auckland with Bianca Sava. By the end of the year membership stands at 82. A symposium is held which ‘piggy backs’ on the meeting of the Faculty of Child and Adolescent Psychiatry. The keynote speakers are Sarah Mares, Lauren Porter and Robyn Dolby – with Colin Hamlin as a Ministry of Health representative and supporter. IMHAANZ says au revoir to Kimberley Powell at the end of 2009 with her return to Canada. Kim remains a kind and consistent supporter of our organisation and its members. Janet Gregory retires and moves to Australia. Maree Foley becomes the second President of the organisation. Maree puts her considerable talents to work consolidating the processes and networking within our organisation and the links we have with other affiliates and with WAIMH. Maree receives funding from the Prime Minister’s Fund to attend the 12th WAIMH World Congress in Leipzig, Germany and, in a memorable meeting of the Affiliates, becomes the Affiliate Council Representative. Maree works with Martin St Andre (the Affiliate Council Chair) over the next 4 years to promote the goals of affiliates within WAIMH. Following the Christchurch earthquakes, IMHAANZ Executive members Lucie Zwimpfer, Maree Foley, Denise Guy and Lauren Porter generate two letters to families with infants in Christchurch. These Letters to Christchurch are subsequently adopted and adapted by other WAIMH affiliates (Japan, Turkey, Australia and Tulane) in the wake of disasters in their own nations. The original letters can be viewed here: Letter to Christchurch 1 and Letter to Christchurch 2. Tools for Professionals: Receive Reflect Relate, the second IMHAANZ conference, is held at Te Papa in Wellington across 3 days and is a massive success. The Keynote Speakers are Dr Deborah Weatherston, Beulah Warren, Lynaire Doherty, Aroha Gray and Kararaina Penehira. Dr Weatherston remains a staunch supporter of IMHAANZ and helps broaden our connections beyond New Zealand. Dr Denise Guy becomes IMHAANZ’s third president. The third IMHAANZ conference, Opportunities within the Challenges is held in Queenstown and feedback is overwhelming positive. International keynotes speakers are Linda Gilkerson, Julie Ribaudo and Hisako Watanabe – alongside New Zealand’s own Commissioner for Children, Dr Russell Wills. IMHAANZ launches it’s new website along with a new logo and Mission Statement. This new website is the culmination of a long journey thinking about how to make the site a more useful member portal, as well as a dynamic place to visit for those interested in infant mental health. IMHAANZ runs its inaugural FAN Trainings at the CQ Events & Conference Centre in Wellington complete with Fussy Baby Network and FAN Founder, Linda Gilkerson, present. FAN stands for Facilitating Attuned Interactions. At the end of these trainings, three IMHAANZ Executive Members – Denise Guy, Judy Hunter and Lucie Zwimpfer – become accredited FAN Trainers which also follows two years of working with and being supervised by Linda. And IMHAANZ joins the international FAN network that brings together FAN users in 19 American states and three countries. The fourth IMHAANZ conference, Protection and Nurturance – Weaving the mat for infants, their families and practitioners, takes place at Te Papa in Wellington with 98.4 of respondents rating it “Excellent” or “Very Good”. There is another stunning line up of speakers including international keynotes: Kevin Nugent, Sherryl Scott Heller and Helen Minnis – and New Zealand’s Minister of Health, Hon. Dr David Clark; Amanda Millar – Journalist, Producer and Director of the film, Celia; and Children’s Commissioner, Judge Andrew Becroft. 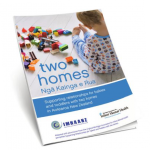 IMHAANZ publishes and launches Two Homes | Ngā Kainga e Rua – a booklet about supporting relationships for babies and toddlers with two homes in Aotearoa New Zealand. It has been adapted with permission from the original Michigan Association for Infant Mental Health pamphlet Supporting Relationships for Infants and Toddlers with Two Homes and is for sale via the IMHAANZ website Two Homes page. IMHAANZ maintains a relatively regular newsletter for its members, a Facebook page and its absolute commitment to improving the knowledge and skills of those working with infants, young children and their families. We invest time in consultation, select committee submissions and networking.